This pear tart recipe uses fresh pears and a few pantry staples to make a sweet, fruity, deliciously simple dessert completely from scratch. 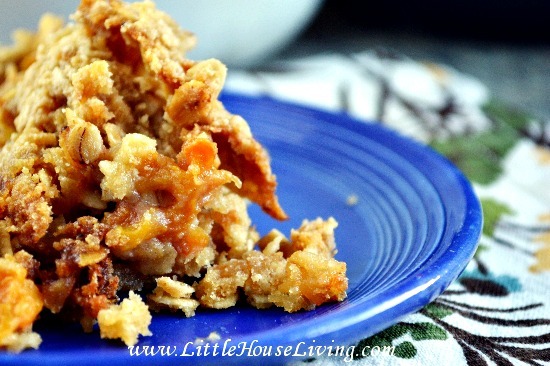 A simple, frugal, tasty way to use up some pears when they’re abundant and in season! He actually spent some time in culinary school and worked for a large baking and catering company in town. When we were dating, he had me hook line and sinker when I tried his homemade cheesecake. Oh wow! So good. I’m not saying that’s why I married him, but it sure didn’t hurt knowing that he knew his way around a kitchen! But this week I decided to turn the tables a bit, and do some baking of my own by making this simple (but delicious) pear tart. Dessert recipes can’t be complicated if I’m the one making them. Truthfully, simple cooking is my style whether it involves sweets or not. I like to use familiar ingredients with only a few steps that still produce tasty results. This pear tart recipe is one such simple dessert that starts with a buttery short dough crust that can be made in the food processor or by hand. The dough is soft and easy to work with when pressing it out in the cute little tart pan. 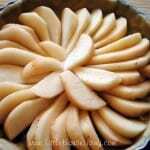 Then you simply arrange peeled and sliced fresh pears in a pretty fan pattern. Finally, you sprinkle the buttery sugar topping on top and let it sink into the pears and make a shimmering sweet sauce as it bakes. Simple and delicious. For the crust: Mix together the dry ingredients. Cut in butter and then mix in the egg yolk and water. It should be a stiff but workable dough ball. Roll out to about 9 inches and place in tart pan. 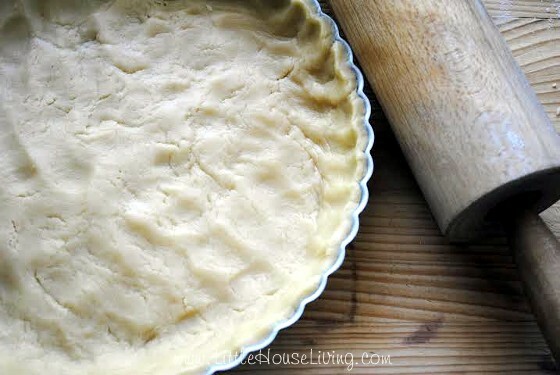 Press dough evenly up the sides of the tart pan with your fingertips. Chill dough in the freezer while slicing the pears. For the filling: Peel and slice pears. Remove crust from freezer and arrange pears in an overlapping fan pattern. Mix remaining flour, sugar and butter in a small bowl. Cover the pears with the flour-sugar-butter mixture by crumbling it overtop. (You may not use all of the filling). Bake at 400ºF for approximately 35 minutes or until crust is golden and filling is bubbly and shiny. If you have some extra pears right now you need to try this Pear Tart Recipe! It’s so delicious and so simple. Do you have an abundance of pears right now? Here are some more pear dessert recipes to try! 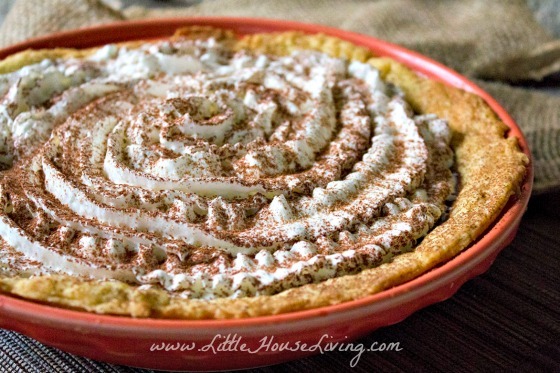 What are some of your favorite pear dessert recipes? Need to print this Pear Tart recipe? Grab it below! This pear tart recipe uses fresh pears and a few pantry staples to make a sweet, fruity, deliciously simple dessert completely from scratch. Mix together the dry ingredients. Cut in butter with a pastry cutter and then mix in the egg yolk and water. It should be a stiff but workable dough ball. Peel and slice pears. Remove crust from freezer and arrange pears in an overlapping fan pattern. Mix remaining flour, sugar and butter in a small bowl. What are your favorite pear recipes? How else do you use fresh pears? Add to the list in the comments section below! 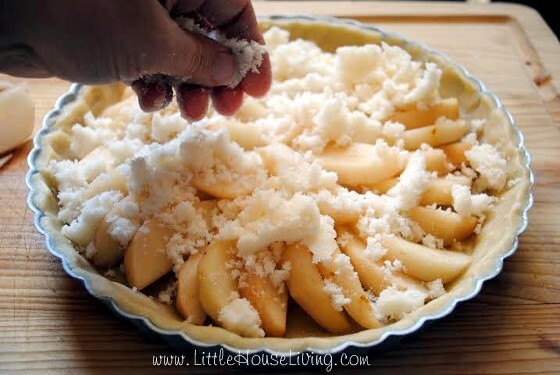 This Simple Pear Tart Recipe was originally published on Little House Living in August 2014. It has been updated as of January 2019. 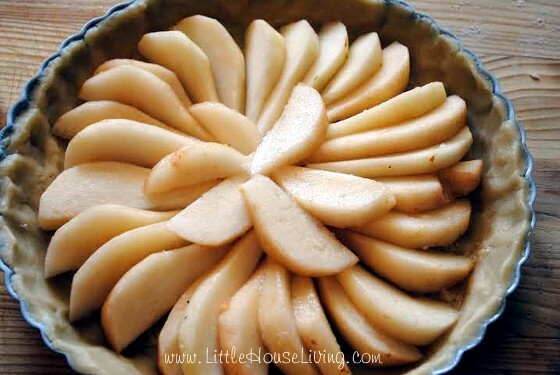 After looking at this, I can’t believe I have actually never made a dessert recipe with pears! I have done lots of stuff with peaches and apples, but never pears. I do enjoy pears, but I tend to forget about them. This dessert looks really good! I love pears! I made some pear and blueberry filled gingerbread tarts last year. Your tart looks delicious! Any dessert with pears sounds wonderful to me. Visiting from Savoring Saturdays . . . our neighborhood pear tree is covered with fruit, so these will be great ideas for using some up. I love fruit tarts! 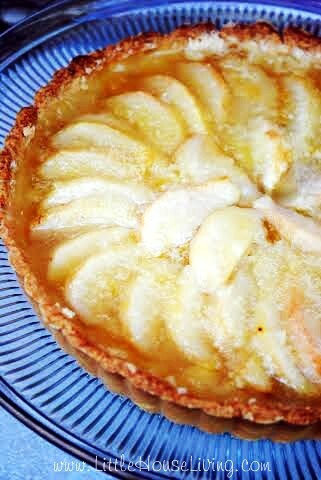 Your pear tart looks scrumptious. This is such a pretty tart. I really like that it looks pretty simple to make. That tart is so pretty! I wish we had access to freshly picked pears. Thanks for sharing @DearCreatives party. 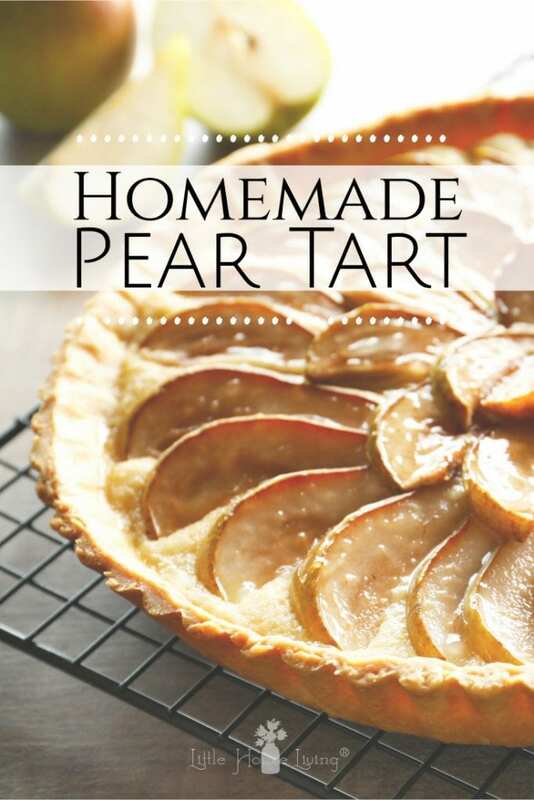 Oh this looks so good- I love just about anything pear-related! Thanks so much for linking up at Snickerdoodle Sunday and I hope you’ll come back this week with new project posts! What a great tip! Hello, my name is Misty, from The LadyPrefers2Save,and I’m one of the new co-hosts for the Merry Monday Linky Party! Thanks for linking up at the Merry Monday’s Linky Party this week. Have an awesome week! This looks so mouthwateringly delicious. Thanks for sharing at Inspire Me Wednesday. Featuring you in this week’s issue. can you advise me if one can use red Bartlett pears for this desert and maybe more ideas recipes for this type pear. I have acquired 80 pounds of these and even passing them out I will still have a lot to work with. Right now they are firm and need more ripening. Such and elegant and delicious dessert. My daughter made this for Christmas Eve dessert, and everyone loved it! Hoping it becomes a Christmas Eve tradition, although seriously, we simply must enjoy this more than once a year. Sounds delicious! Wondering if this will freeze well? I sliced too many pears for a pear custard, so was looking for a second recipe. Thought this one looked good for mini pie tarts. But you seem to have left out a step or two. For one thing, the ingredient list has the measurements, and the instructions state “add dry ingredients” and then later you state ” mix the remaining sugar, flour, butter in bowl” — what remaining sugar, flour, butter? No measurements given for these “remaining” ingredients and how are they remaining? There is no mention to put any portion of the dry ingredients aside for later. Then you don’t say when to sprinkle this remaining ingredient mix on –before or after you pour the filling over the pears? It seems like a great recipe, and I can improvise from it, but I see this sort of lack of clarity with online recipes quite often–either no one has made it to find the flaws, or everyone is too polite to say anything in the comments. I’m just trying to help out. I agree. Looks wonderful, but some key steps are definitely missing. I really want to try this, but what are the filling ingredients? The filling ingredients are directly below the crust ingredients above and the instructions follow the crust instructions. I had excess pears and we were having people for dinner. After getting home from work I followed this recipe and the result was amazing!!! And I am new to shortcrust pastry. Thank you and now I am planning to trial a strawberry tart…. Going to try and make today, what size tart Pam do you use?